Focus. This week’s challenge is inspired by Matthew George’s post on focus, in which he introduced us to the basics of depth of field and aperture. In the first shot taken at the Po Lin Monastery in Hong Kong the focus is on the fragrant incense with the foreground blurred, giving a bit more depth of field to the photo. 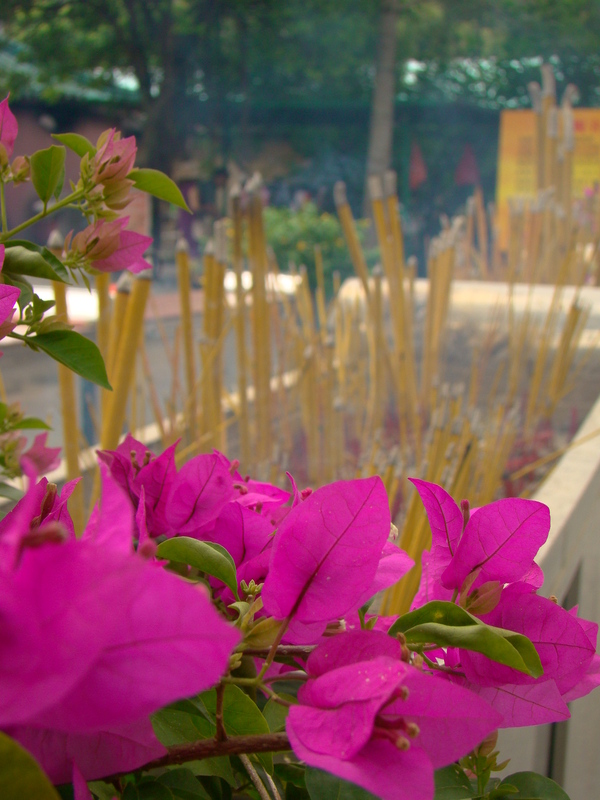 In contrast, the focal point of the very second shot is in the foreground (the beautiful bougainvillea flowers) of the image. Incense is aromatic material which releases fragrant smoke when burned and is used for a variety of purposes, including the ceremonies of all the main religions. The earliest documented instance of incense utilization comes from the ancient Chinese, who employed incense composed of herbs and plant products as a component of formalized ceremonial rites. The burned incense may be intended as a sacrificial offering to various deity or to serve as an aid in prayer. Here are more pictures for this week’s theme. Thanks and a very big welcome to my journey Ruth!! I love the colour – and you’ve done a great job with the change of focus! Thanks! I always have some incense burning in my house, think its a very warm and welcome fragrance. Me too 🙂 totally agree! There’s something magical about incense isn’t there? Great contrast in focus for this challenge! Thanks Josette! I agree, incense also holds something mystical for me and I love burning it in my house! gorgeous photos dear! amazing place here! Fantastic pictures! I am now a follower! Thanks and a huge welcome to my journey!! Thanks Nessy San. I love bougainvillea, they are so beautiful and make me think of tropical summers. Thanks Bebs! It was such a beautiful and peaceful setting. Thanks Bams. 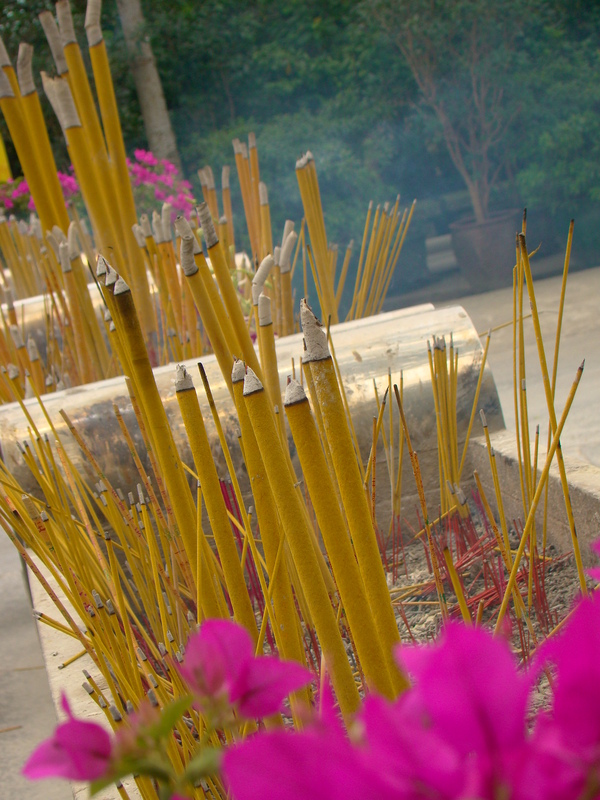 I love the beautiful muted colours of the incense they burn at all the temples in China. Thank you! I ended up taking so many photos of the aromatic Incense. I love yours too! Thanks for the visits on both my blogs! Thank you! I am having loads of fun playing around with the settings on my camera. Beautiful interpretation of the challenge! Perfect entry … I have a big red beautiful bougainvillea bush in my backyard. It is magnificent when it bloom. Two very good examples of focusing. Great response to the challenge. I can almost smell the incense. Thanks Sue. I do love the smell of incense, I usually have some burning in my house. Two different photos and they are both so pretty. Love the contrast of colors in the second picture.. Thanks. The yellow incence against the bright purple flowers are quite striking. Thanks for that lovely compliment.